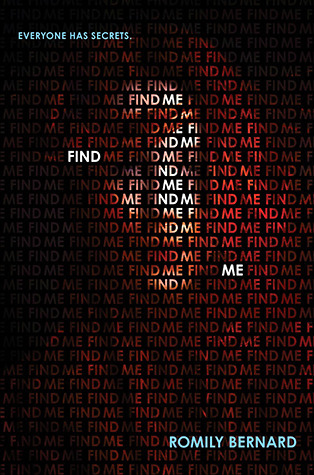 Find Me follows Wick, a teenage hacker transplanted into picturesque suburbia with her sister and a pair of loving foster parents, as she finds herself forced into getting to the truth behind the apparent suicide of Tessa, a girl who used to be her best friend. Along the way, Wick tries to stay out of the reach of a cop who is determined to bring down Wick's fugitive father -- and Wick too, if he has any say in it. Wick's whole life revolves around her little sister Lily, and she is determined to protect her at all costs. Wick and Lily have had a rough life, and while Lily is optimistic that this foster family is finally going to work out, Wick isn't so sure -- she's spent her life running and doesn't quite know how to stop yet. Unlike a lot of other reviews that I saw on Goodreads and such, I really liked Wick and felt like her reactions were pretty true to her character. She is someone who has a very strong distrust of adults in general and especially authority figures. She's snarky and sarcastic as a defense to keep others from getting too close, but underneath she's carrying a lot of pain. Do I think she would have been way better off had she gone to an adult or the police the second she started getting in over her head? Um, heck yes! Usually the "no, we can't go to an adult!" aspect of YA stories bothers me, but in this case, it was at least in line with Wick's character. Bernard created a great voice for Wick, who felt like the most fleshed out of all of the characters. Most of the secondary characters seemed a little flat/stereotyped, however. Lily's the bubbly, optimistic younger sibling; Bren and Todd are the well-meaning, clean-cut suburban parents; Lauren is the popular girl who's still friends with Wick; there's a bunch of mean girls and their jock dude friends, etc. For as well-defined as Wick's voice was, the rest of the cast seemed to be lacking and kind of unmemorable at times. Also, I wasn't sold on the romance between Wick and Griff. The story would have worked if they were friends and not suddenly, occasionally kind of creepily, making out. I went back and forth on whether or not I though Griff was a total d-bag jerk or not; he was really hard to get a read on. Also, I don't know many teenage boys, especially kind of rough-and-tumble guys like Griff, who would spout off with lines about how "I've wanted you for three years" and such. For as real as I felt Wick's voice was, I felt a little put off almost every time Griff showed up. I feel like Find Me is a good book that could have easily been a great book, but which didn't quite get there for me. It has all of the elements of an awesome mystery/thriller, but it could have been better. Bernard writes some great tense scenes, particularly the last few chapters, but the rest of the book was so seemingly methodical and slower paced that it felt jarring. The story is self contained, but the epilogue sets things up for a sequel. I think Bernard has great promise as a writer, so I'll probably keep an eye out for whatever she comes up with next.